(Bloomberg) -- You know things are bad for Chinese equities if an entire week without gains can be spun positively. While stocks fell in the past five days, there was no sign of the panic we saw in October, when the threat of pledged shares plagued the market. The Shanghai Composite Index’s declines exceeded 1 percent only on Friday, following the longest stretch of muted moves since July. Car makers and casinos had a rough week, but average intraday swings for the broader market were the lowest they’ve been all quarter. We’ve been taking stock of China’s efforts to bolster this year’s worst-performing major equity benchmark and address record bond defaults. Lower volatility is a good start for investors everywhere, but additional support is expected from policy makers before we get anything that looks like a sustained rebound in China. More details on how existing measures may work (equity finance tool, anyone?) would be helpful. China’s sweeping efforts to support the private sector are taking a toll on the country’s lenders. Their shares took a beating Friday after the regulator asked large banks to increase their loans to non-state firms to at least one-third of new lending, and two-thirds for small and medium-sized banks (recent data shows the proportion of credit extended to non-state firms was less than a quarter). The concern is that borrowers not backed by the government are a lot riskier, and a ramp up in lending may leave banks with an even bigger pile of souring loans. Financial stocks were among the biggest decliners onshore following the news. Three of the big four -- Industrial & Commercial Bank of China Ltd., China Construction Bank Corp. and Agricultural Bank of China Ltd. -- fell more than 3 percent. 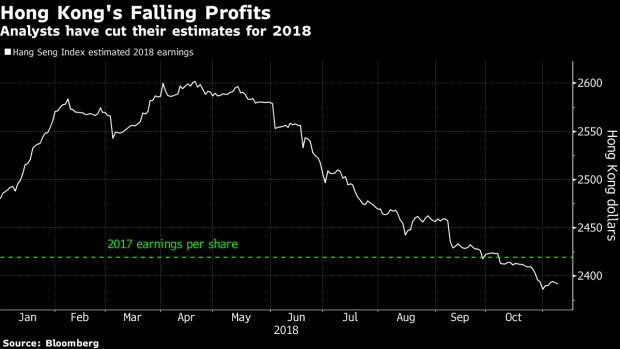 It’s shaping up to be yet another ugly earnings season for Chinese Internet and tech stocks. AAC Technologies Holdings Inc. had quite the shocker, falling 18 percent this week -- its steepest rout since May 2010. U.S.-listed online travel agency Ctrip.com International Ltd. slumped 19 percent Thursday after a disappointing forecast for sales growth. Worries are growing that the good old days of super fast growth for China’s most innovative companies may be over. That hurt shares in Hong Kong, which resumed declines after a short squeeze caught bears off guard last week (the city’s shares were among the world’s worst performers Friday). All eyes will be on Tencent Holdings Ltd. when the Internet giant reports quarterly results next week. Analysts continued to trim their earnings estimates for Hong Kong’s largest companies in recent months. They now predict a 1.1 percent contraction on average this year, according to data compiled by Bloomberg. Here’s what else caught our eye. These bondholders are getting their coupons in ham. Foreign investors are buying Chinese distressed debt. Life as a listed company hasn’t been easy for Meituan Dianping. Some 50 million homes in China are empty. Get ready for Single’s Day. Is Hong Kong just another Chinese city? A Japanese game-maker’s forecast bodes ill for Tencent. Value strategies surprisingly worked in October. So many boards, so little time. Corn and wheat markets are going wild.